The Etch-a-Sketch. A standard bearer for childhood, and one that most of us never really mastered. While Yelizaveta Lokshina can't help you create awe-inspiring portraits from aluminum powder, she has managed to update the toy for the digital age. Using an Arduino, a few buttons and a pressure sensor crammed inside a hollowed-out Etch-a-Sketch, the 3.0 version of the doodler is able to draw in old school gray, as well as vibrant colors created by blending an RGB palette. While holding down the red, green or blue button you squeeze the pressure sensor to add more or less of individual hues. The same sensor is used to change brush width when you hold down the black button. There's even a secret mode that automatically cycles through colors and thicknesses for creating vibrant, almost hallucinatory patterns. At the moment, the dual doodle knobs need to be physically connected to a computer so that a Processing script can work its magic and render the virtual Etch-a-Sketch. But, future versions may include wireless for sketching out images from the comfort of a couch and an accelerometer for the replicating the satisfying sensation of shaking the red fram to erase your creation. Basically, it's still a work in progress. Drawing with the Etch-a-Sketch 3.0 is just as satisfying, in a tactile sense, as the original, though we struggled slightly to get the hang of the pressure sensitive selector. One thing's for sure, though, the kids love it even more than the 1960 creation. Check out the video after the break to see it in action on the floor of the ITP Spring Show. 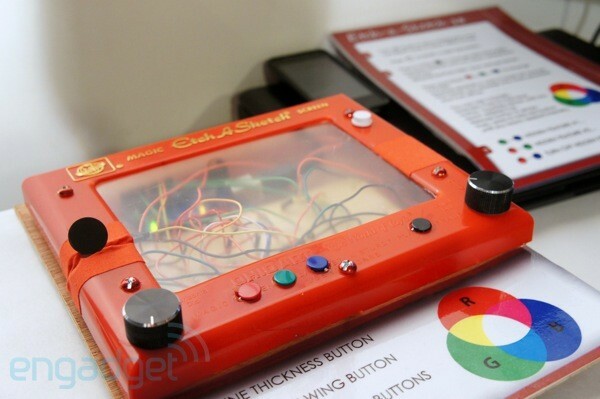 Etch-a-Sketch 3.0 hands-on (video) originally appeared on Engadget on Tue, 15 May 2012 20:21:00 EST. Please see our terms for use of feeds.